Ansonia Clock Co. "Lydia", ca 1894. 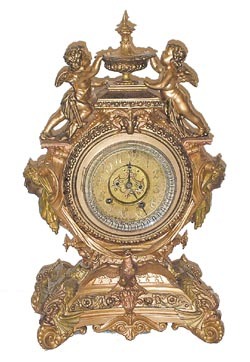 One of the figural clocks most collectors are trying to find for their collections. It is a much larger clock than the pictures in the catalogs depict. It stands 19 1/2 inches high, and is very heavy. The metal is finished in Barbedienne, a member of the gold family. To point out just a few of the figures on the clock, starting at the base; sea serpents make up each of the 4 corners extending down to the feet. There is an eagle on the base with banners in his mouth that reach up each side to the head of a goddess. There are cherubs standing on each side of the urn. The urn top appears to have some fresh finish. There is a rams head in the center above the dial, same on the back. The cherubs have a bow over their shoulder. The later Lydia\'s did not have that feature. Gilt 2 piece porcelain dial with open escapement, silver dial ring, beveled glass. Movement is 8 day, striking on a gong. This is a very ornately decorated clock, complete with a back door, correct pendulum, and hands. Ly-Ansonia No.1585.